I did my penultimate run to Charing Cross yesterday. It was not quite a run to chemo, but close enough. I had to have a port fitted as the veins in my arms have been suffering from having the drugs that way, so ran to the op and will have chemo today. Once again it was a really joyful run, this time with Lucy and two of my sisters, Liz and Mandy. Liz ran alongside her local river in Harpenden while I was running to my third treatment in July and then trained specially to come and do the run with me yesterday. It’s the furthest she’s ever run and I’ve felt really moved that while I’ve been coping with the treatment, she’s been training to come and be with me. I’m running slower each time and I had to stop a couple of times to have a breather. It’s reminding me of what it’s like when you’re starting out running. I’ve got used to being able to do ten miles without a second thought. Now I remember what it’s like to be the slowest runner, to feel like you’re holding people back, to know that I genuinely couldn’t go much further, but also to realise that in this kind of run none of that matters. It’s about the experience of running, and the friendship of the people you’re running with. Mark Rowlands talks about the heartbeat of a run which is the essence of the run, what the run really is. The heartbeat of yesterday’s run was solidarity – we’re in this with you. 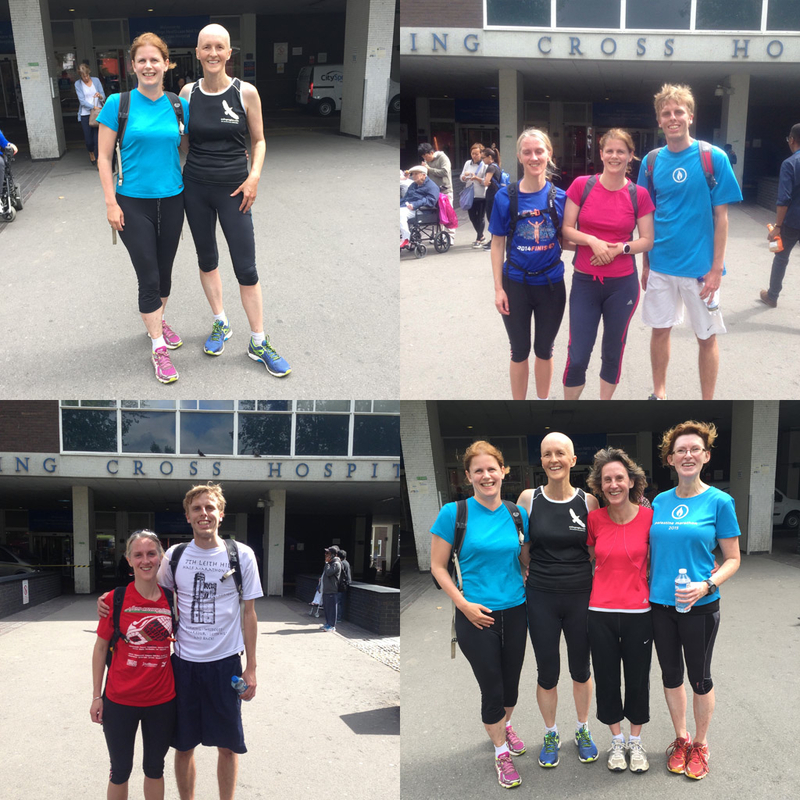 I wouldn’t have kept going if it hadn’t been for my run companions and I’m so grateful to Lucy, Chris, Harry, Mandy and Liz who have done these runs with me over the last few weeks. After today, there will be just one more treatment to go (please, God) and I’m feeling demob-happy already. Even though I’ve got two more periods of feeling yuk to go, it feels like the end is in sight. I might not be feeling so upbeat over the weekend as the drugs kick in, but for now this is a good place to be.